Staff was very friendly and super helpful with all questions. My girlfriend and I loved the cabin and the property. We wish we could have had better weather to experience more of the area. Although we really enjoyed watching movies by the fireplace and relaxing in the hot tub as well! Kitchen was everything one could dream for and more. The cabin was great can't wait to come back. We had the best weekend!! We enjoyed going to Main Street in Bryson City for coffee and a stroll we also enjoyed the Deep Creek Hike. It was a great easy hike to the waterfall with our daughter. She was entertained by the stash of toys. Two thumbs up- we will come back soon. The cabin was the perfect place for our little family to get away for the weekend and celebrate my 30th birthday! We love everything about it. Very friendly and helpful! Loved the place! Better than we expected and we'll definitely be returning. Got lost on the way there and was graciously helped by a service member! Everyone was great! Everything was great! Didn't have much contact with anyone but didn't need any. Everything was great and on working order. When I did talk to them, they were helpful and very friendly. I worked with Cathie, she was amazing and helpful all the way from start to finish. She called me to make sure that I made it to my cabin. She was gracious to allow me a late check out. She provided outstanding customer service. The property was breathtaking and very secluded. The property was immaculate and very well kept. 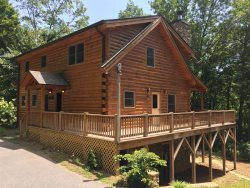 I wanted a cabin that was near Harrah's Casino, and the cabin had everything I was looking for with a reasonable price that offered you the option of a down payment if needed. I rented the cabin as a Birthday present. The Great Smokey Cabin Rentals team was very professional and willing to ask every question that I had. Looking forward to coming back in the future. This trip was my family's first trip to the NC mountains and we really enjoyed it. The property was everything we asked for and more. If I had to leave a negative comment about the property during our stay was the loss of water pressure but, when I contacted the staff they had someone out right away to fix the problem. We are still planning on coming back and some close friends of ours have already booked there trip for this March!! We have stayed before and the staff are very friendly and helpful and the cabins are great! The hot tub was great and especially the stars at night while relaxing in the hot tub. The people I talked with were very friendly and helpful. It was a very nice property and we enjoyed our stay. 41st Wedding Anniversary. Very Helpful Staff when I needed instructions on my stay. It was Amazing!!! Quick response time and I was provided with all the information I needed prior to check in. The house was beautiful and just what we had hoped. The line on the front porch was perfect- our dog loved being able to lay in the sun in the morning! We really enjoyed the fire pit and the other amenities of the house! Thanks for a great get away! We had a great time staying here and plan to again soon. Beautiful views and who doesn't love a hot tub with a billion stars? Perfect. Thank you for having this cabin available for us. We have enjoyed it so much. We loved everything about this gorgeous cabin! Thank you for opening up your home to us. Simply beautiful! we hope to come back when the trees our full.